About 1853, Joseph Shortz bought the property of the Black Horse Tavern. He tore down the old stone building, and rebuilt a larger brick hotel, which he called “THE UNITED STATES”. 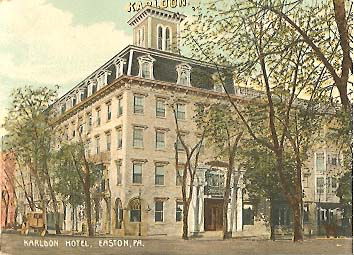 It became a very popular hotel especially for Lafayette College functions. Ownership was transferred to Samuel Hayden in the 1860’s, and upon his death to his son, Howard Hayden. After his death, William Kuebler purchased the property and called it the “KARLDON”- a memorial to his two sons, Karl and Donald. He very greatly enlarged the property and improved it, and kept up the high reputation of the hotel till his death.